On the 12th of March, four consecutive tweets were posted by Rob Wilkins that shook the literary world. These tweets announced that after a long battle with Alzheimer’s disease, Sir Terry Pratchett had taken ‘Death’s arm and followed him through the doors and on to the black desert under the endless night’. The world had lost one of its greatest writers of fantasy, and everything seemed a little bit darker as a result. For many young readers around the world Sir Terry Pratchett served as a gateway to the world of fantasy literature. While he may not have been the first author to introduce me to the genre (that title probably falls with JK Rowling), his work was a guiding light in allowing me to discover the possibilities that the genre held. Sir Terry Pratchett was a master of his form, and his penchant for the quirky and bizarre helped to cement him as a unique author. Few others could portray a vibrant realm like Discworld as he did, so filled with wonderfully strange characters, be they protagonists such as the cowardly wizard, Rincewind, or supporting characters like Corporal Nobbs of The City Watch, the kind of person you could trust with your life but not your money. Pratchett knew how to make each significant and memorable in their own right and, no matter how dark his narratives were at times, there was always some semblance of joy to be found within them. Even the nature of the announcement of his death, while deeply sorrowful, maintained a bittersweet nature reminiscent of his novels. 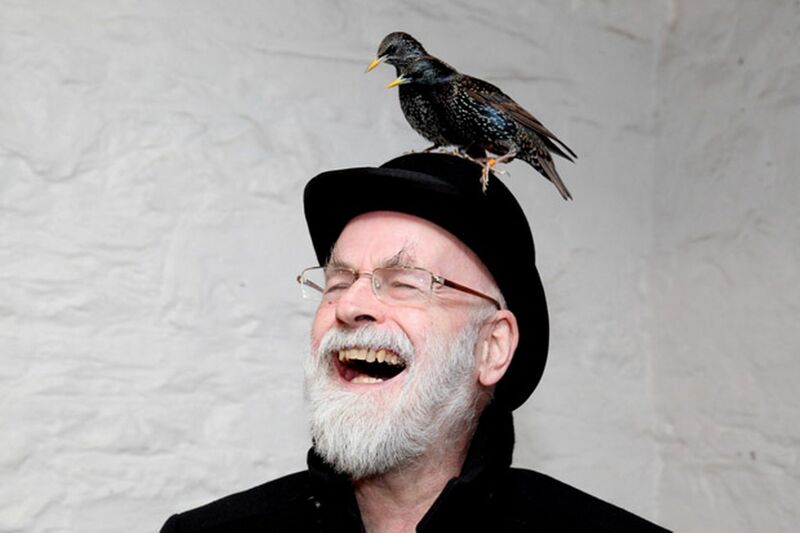 The tweets saw Wilkins invoking one of Pratchett’s most popular and famous characters, Death. Featured in all but two of Pratchett’s acclaimed Discworld novels, the character of Death offered and will continue to offer a great deal of comfort for those facing their own mortality thanks to anthropomorphic personification’s less frightening portrayal and dark sense of humour. For me, as the morbid and somewhat gothic youth I was all of six years ago, Pratchett’s depiction of Death fascinated me. Moreover, it helped me to deal with the passing of a member of my own family, just as it’s served to comfort many other individuals over the years. While I’m unable to vouch for the writer’s own friends and family, I like to think that it’s of some consolation as it’s been for Pratchett’s fans the world over. I can’t claim to have read every single work written by Sir Terry over his fruitful career, one that spanned 44 years in total; with more than 40 novels in his seminal Discworld series alone and over 99 in total the task would border on Herculean. However, even the most casual readers of works can find themselves feeling a great sense of loss as a result of his untimely passing. To avoid leaving this article on too morbid a note, I feel it’s only appropriate that things should be left to the master wordsmith himself. While his passing signifies a great loss for the literary world, as Death states in Good Omens: ‘DON’T THINK OF IT AS DYING … JUST THINK OF IT AS LEAVING EARLY TO AVOID THE RUSH’. Nico is a third year English Literature student at the University of Edinburgh and a frequent contributor to the film section of The Student newspaper. He is also of the persuasion that just like gravy and tea, you can never have too much cynicism. I read this article and found it very interesting, thought it might be something for you. The article is called Terry Pratchett, In Memoriam and is located at http://prancingthroughlife.com/2015/03/25/terry-pratchett-in-memoriam/.